You are here: Home / Live / how and why i menu plan. 1. it saves time. the whole process of looking through grocery store ads for deals, planning out the meals we’re going to eat for the upcoming week, and making a grocery list can seem like just another big “to do” on my list, and can take an hour or two to plan everything out. that, by itself, does not sound appealing! but when i consider all the time i would otherwise spend during the week thinking about what we’re going to eat, looking through my pantry, and then going to the grocery store to buy the ingredients i don’t have…all on a daily basis…well, i’ll take the 1 hour to sit down and do all the planning! 2. no more grocery store trips. that’s not to say that i’ll never go to the grocery store again, but i will not have to go nearly as often! once a week is plenty, especially when i have my kids in tow. and when i plan out my meals for the week, i really do only need to go to the store once because i get everything i need in one trip! 3. it saves my budget. because i’m not going to the store almost daily anymore, i don’t buy all those unnecessary things that magically sneak into my cart every single time i shop (whether by me accidentally putting the chocolate in there, or by the four tiny hands secretly placing small cars or yet another box of popsicles in the cart). another way it saves me money is that i’m not spending it on things that i “think i might potentially need” for a meal that week. i buy only what i need. there are so many other advantages to meal planning, but i’ll get on with the rest of the post. 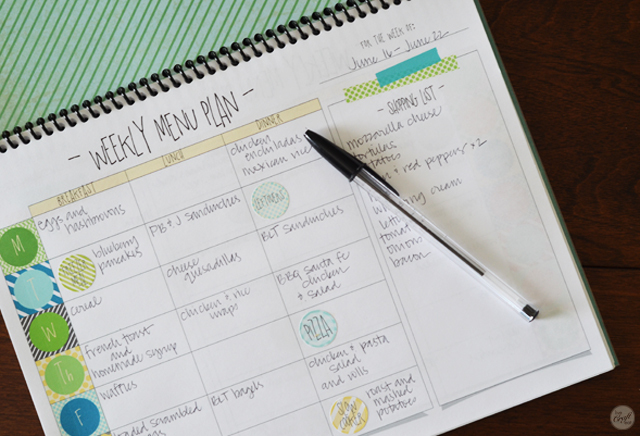 in my need to be organized, i made myself a meal planner with enough space to meal plan weekly for the whole year, and you can just as easily make one too! i’ll show you how. 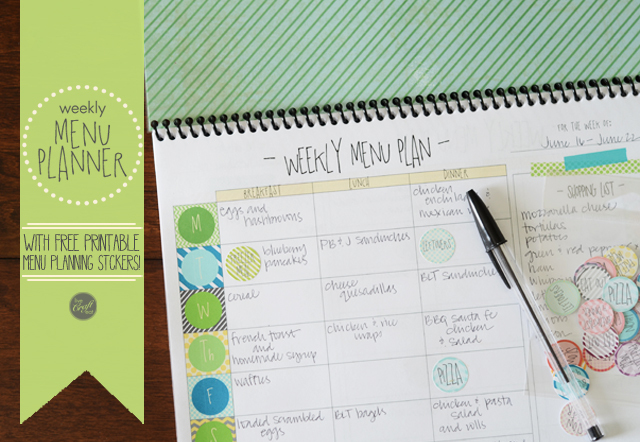 the first step is to get a meal planning sheet that you adore! you’re going to be looking at it often, so make sure it’s something that you really love to look at. i used one that i have available in my etsy shop (<– click to go see them! 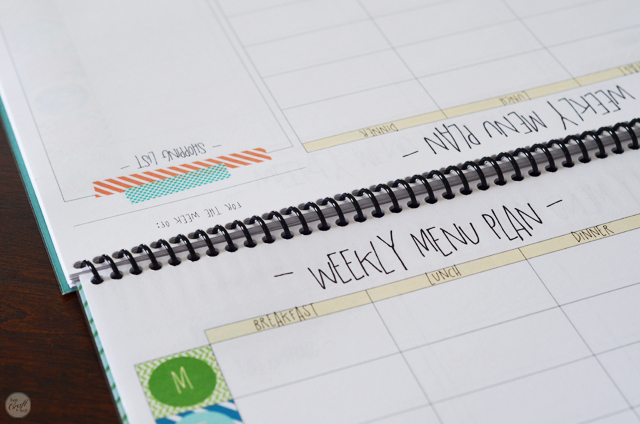 ), but i also have a bunch of FREE meal planning templates over here. (<– click to go to the freebie post!) 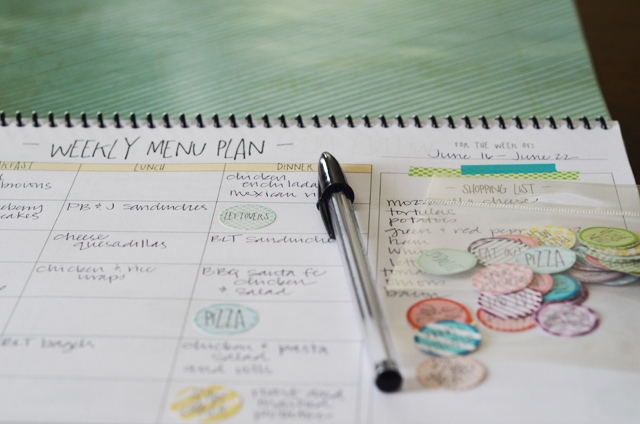 my preference is to have one that includes a place for the date(s), and a shopping list so i can easily jot down the things i need to buy as i write out the meals we’ll be eating. i also like one that has a place for the three meals we eat every day: breakfast, lunch, and dinner. once you’ve found one you like, print out as many sheets as you need. i printed 52, one for each week of the year (only 26 sheets if you do front-and-back printing). and i actually printed mine from my home printer instead of taking them to an office supply store to have them printed because the ones i was using didn’t use very much ink and so was sufficiently cheaper than taking it somewhere to be printed. the next thing i did was make a 8.5″x11″ cover by using scrapbook paper and a label. i laminated it for durability and to make sure it wouldn’t get wet sitting on a counter somewhere in my kitchen. 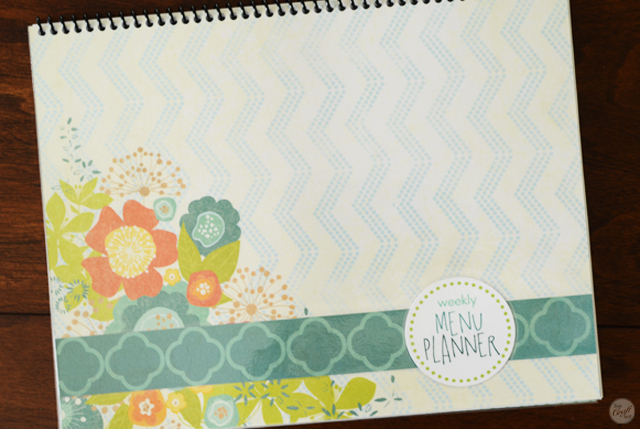 double-sided scrapbook paper is great because it makes the outside AND inside of your menu planner look fab. and while i did not have the pages for my meal planner printed at an office-supply store, i did take the entire thing to one once it was all put together to have it bound. it only cost me $3 to have the entire thing bound with a plastic spiral binding. so now that my (easy!) menu planner has been put together, i wanted to add even more organization to it. 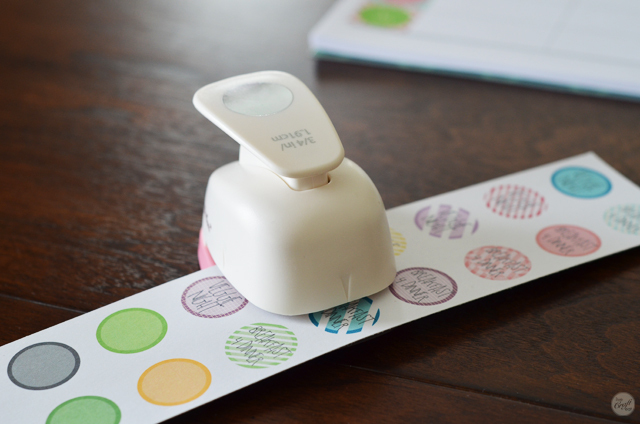 i got some 8.5″x11″ full-sheet sticker labels (like these ones – aff link) while i was at the office supply store and got a 3/4″ circle punch to create these cute stickers. they have words like “pizza,” “slow cooker,” “leftovers,” “freezer meal,” etc to remind me what kind of work i need to put into that meal. for example, if i have leftover waffles or pancakes one day i put the remainder in the freezer – then when we’re going to eat them again, i put a “freezer meal” sticker beside that meal so i know to get them out the night before to defrost in the fridge. or, if i have a “slow cooker” meal, i put that sticker on to remind myself that i need to get it put together in the morning instead of waiting until dinner time to get it ready. the stickers themselves are super easy to put together and take only a minute. 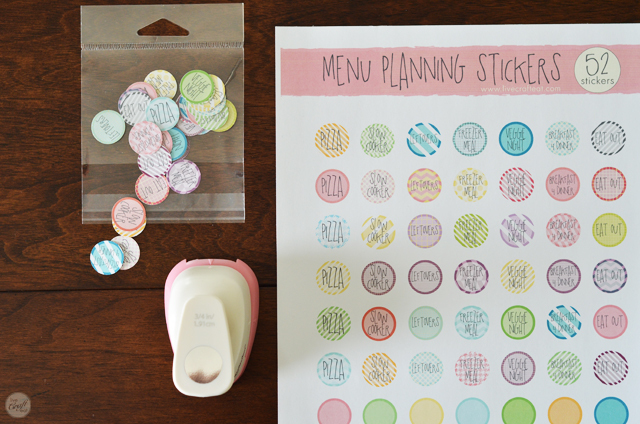 you can download my free printable menu planning stickers (<– click there or on the image itself to download!) 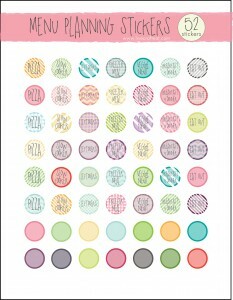 so you can print out your own, and then simply punch them out with a circle punch (or if you don’t have one –i got mine for $4 at michael’s– you can simply cut them into squares. either way works! here’s one on amazon that is similar [aff link]). 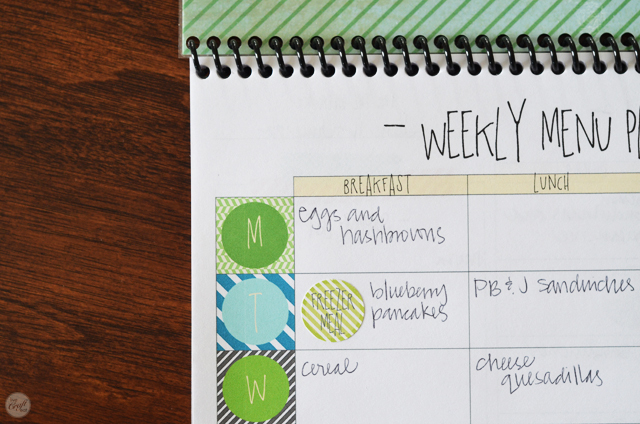 store them in an envelope and keep with your meal planner. 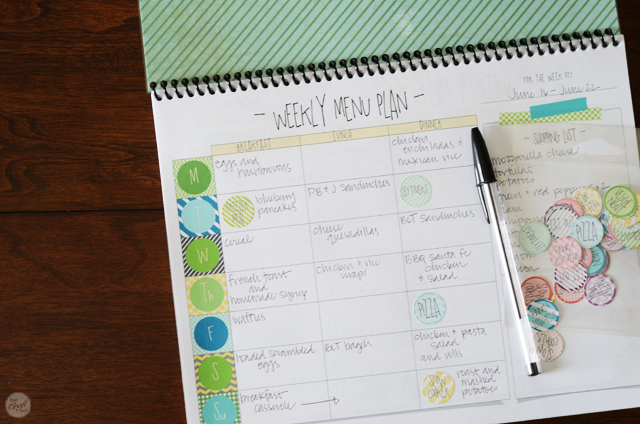 here’s an example of the stickers “in action.” when i glance at my planner the night before, i know exactly what prep i need to do for the next day…for breakfast, lunch, and dinner. do you meal plan? what’s your favorite way of doing it and what are your best tips for keeping it all organized? i’d love to hear what you have to say in the comments! These are adorable! Thanks for sharing. They are a great idea, to get a glace of what needs to be done for the meals at night, it’s something i’ve thought of but haven’t remedied, I’ll have to give this a try. I’ve been looking for ways to get more stickers into my Bullet Journal anyways! 🙂 Oh, and I love your blog name, I wish I had thought of it, it’s perfect for the type of things I want to blog about. Thanks Kim – glad you like it. 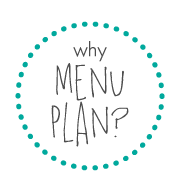 This is a really good system and I feel inspired to be better at menu planning. 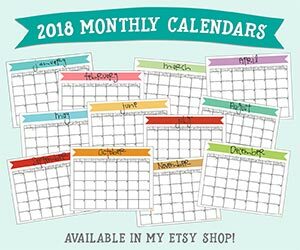 Thanks for sharing the printables. I am printing the stickers right now! That’s great, Shannon! I’m glad you like them! Thanks so much for the sticker template, they are adorable! I was wondering if you had an empty template, one without any writing, so that I can actually write the specific name of the meal I’m making that day. Thanks! Hi Sarah! Unfortunately I don’t have a blank template at the moment. When I get some time I may be able to put one together and if/when I do, I’ll post it on this post. Thanks so much for asking! I’ll be on the lookout for the blank template too! I just found your great blog today and was wondering if these were still available? I can’t seem to get them to download!! Thank you! !